It was standing room only when Shutford Book Club hosted its first-ever live event with one of Britain’s most acclaimed contemporary novelists as its guest of honour. 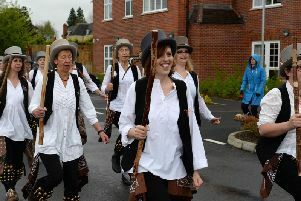 Author Rachel Joyce, pictured third from right, front row, was contacted by group member Lynne Parsons, who invited Rachel to meet her fans at Shutford Village Hall. The novelist was introduced by Kirsten Parrish and interviewed by Jane Moffatt, with funds raised going to the DigiSmart charity, which supports disadvantaged children with developing their literacy skills through technology.